At some point during human evolution, a handful of genetic changes triggered a dramatic threefold expansion of the brain's neocortex, the wrinkly outermost layer of brain tissue responsible for everything from language to self-awareness to abstract thought. 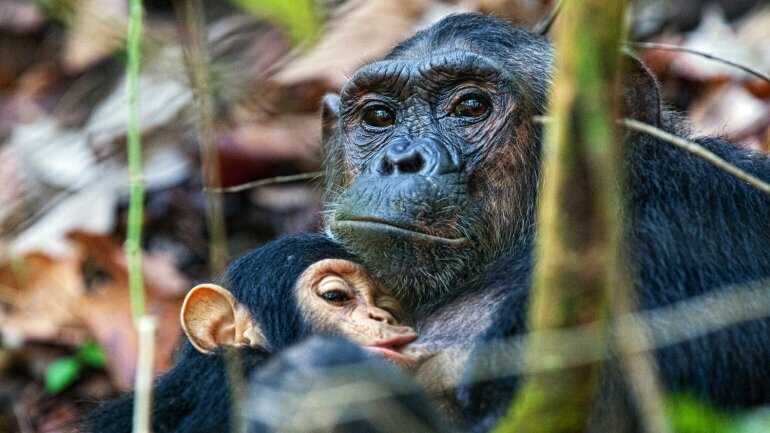 Identifying what drove this evolutionary shift is fundamental to understanding what makes us human, but has been particularly challenging for scientists because of ethical prohibitions against studying the developing brains of our closest living relative, the chimpanzee, in the lab. "By birth, the human cortex is already twice as large as in the chimpanzee, so we need to go back much earlier into embryonic development to understand the events that drive this incredible growth," said Arnold Kriegstein, MD, Ph.D., the John Bowes Distinguished Professor in Stem Cell and Tissue Biology, founding director of the Eli and Edyth Broad Center of Regenerative Medicine and Stem Cell Research at UC San Francisco, and member of the UCSF Weill Institute for Neurosciences. In a study published February 7, 2019, in Cell, Kriegstein and collaborators have gotten around this impasse by creating chimpanzee brain "organoids"—small clusters of brain cells grown from stem cells in a laboratory dish that mimic the development and organization of full-size brains. Kriegstein's group was among the early pioneers of growing human brain organoids from so-called induced pluripotent stem cells (iPSCs)—adult cells (usually skin cells) reprogrammed into stem cells that can become any tissue in the body. Organoids have since become a valuable tool for studying human tissue development and disease in a controlled laboratory setting, but the new study, in which the researchers generated 56 organoids from stem cells derived from the skin of eight chimpanzees and 10 humans, marks the first time researchers have been able to produce and study chimpanzee brain organoids en masse. "Our ability to take skin cells from an adult chimpanzee, turn them into iPSCs, and then study their development in laboratory dishes is astounding," said Kriegstein. "It's a 'science fiction' experiment that couldn't have happened 10 years ago." "These chimpanzee organoids give us an otherwise inaccessible window to six million years of our evolution. They let us ask new questions about what makes us human," added study co–first author Alex Pollen, Ph.D., an assistant professor of neurology and former Kriegstein lab postdoctoral researcher, who led the development of the new great ape stem cell and organoid technology. In the new study, co–first author Aparna Bhaduri, Ph.D., a postdoctoral researcher in the Kriegstein lab, deconstructed human and chimpanzee organoids at different stages of development, allowing her to directly compare the specific cell types and genetic programs that orchestrate the growth of the chimp and human brain. By looking for differences in gene activity between human organoids and chimp organoids (as well as reference tissue from another primate, the rhesus macaque monkey) Bhaduri identified several hundred genetic changes unique to the human lineage that could help explain the evolutionary origins of the distinctly human brain. For instance, Bhaduri discovered that neural precursor cells called outer radial glia (oRG)—originally discovered by the Kriegstein lab—showed heightened activity of a key growth signaling network known as the mTOR pathway in human organoids. The Kriegstein lab has been studying the potential role of oRGs in the expansion of the human cortex for nearly a decade, "so it was particularly exciting to discover a molecular pathway in these cells that appears to have been specifically targeted during evolution and may help explain their specialized role in generating the advanced human cortex," Bhaduri said. Tantalizingly, problems with mTOR signaling have also been linked to autism and other uniquely human neurodevelopmental disorders, suggesting new questions about whether pathways involved in the relatively recent evolution of our unusually large brains play some special role in these disorders. For his part, Pollen says he has been working towards these experiments for more than a decade, since he was an undergraduate researcher studying the evolution of cichlid fishes in Tanzania's Lake Tanganyika, just miles from Jane Goodall's famous chimpanzee research station at Gombe Stream National Park. "Being so close to wild chimpanzees made me want to ask questions about our own species' evolution," Pollen said. "But first we needed genomes, stem cells, and single-cell RNA sequencing to be able to understand the evolutionary programs that drive brain development in the two species. All of these things have since fallen into place, letting us address these long-standing questions more precisely than ever before."